I wake up too early at 7AM and need my morning coffee, so I go to the Explorers Café for a cappuccino. After sitting in the leather recliner looking out at the calm Pacific Ocean from the quiet library, I am feeling much better, and then go for breakfast in the Rotterdam Dining Room, which opens at 8AM. I have a cup of tea and a frittata as I chat with my fellow passengers. 11AM Showroom – Pacific People: How the Islanders Arrived – Charlie Urbanowicz explains how the original inhabitants of the islands crossed the Pacific Ocean and where they came from. I learn that human migrations used cloud tops over the island groups for navigation. I already knew they used wave patterns, the Sun and stars to navigate. 3PM Showroom – The Wildlife of Remote Pacific Islands – Hawaii and Tahiti – Clive Catchpole presents some of the fascinating and unusual creatures that inhabit these isolated islands. Clive points out that the Pacific Islands we will be visiting have very few endemic species. Most species were imported. He points out that the Humpback whale migration is in full swing right now, and we will likely see them in Maui. He also talks about the big seabirds, such as Albatross (offshore), Boobies, Gannets and Frigate birds found near shore. After dinner, I enjoy a Benedictine liqueur while listening to Catch A Wave, a Beach Boys tribute band this evening in the Showroom. 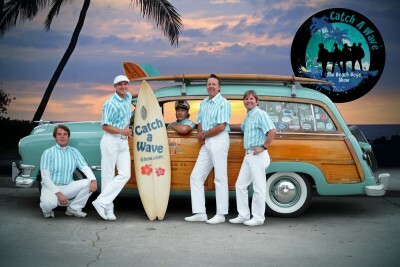 The tunes are very well done, with a near-perfect 5-part harmony, and they are dressed in the early striped shirts and white pants the Beach Boys originally performed in. However they just stand there – no movement or dancing around during their performance. After the show, I go to the office to check that they know about my departure from the ship in Hilo, and re-boarding in the following day in Kailua-Kona. The young woman tells me my plans are contrary to the US Merchant Marine Act (successor to the Jones Act), and I will be subject to a $300 charge by the US government for contravening this maritime law. She points out that the cruise line has no problem with me leaving and rejoining the ship on the Big Island of Hawaii, but the US government does. This means I have to cancel my plans to see Mauna Kea at night, so I send an email to the Old Hawaiian B&B to cancel my night’s stay in Hilo. I will also have to contact Harper’s Car Rentals to change my arrangements to a one-day rental with no drop off in Kona, but I can wait until we arrive in Honolulu so I don’t have to pay the expensive per minute rates while aboard ship. This is very disappointing, since I was looking forward to seeing the night sky from Mauna Kea. Perhaps I’ll drive up there during the day, since my rental car is a proper 4×4 Ford Explorer truck. I will have to decide very soon how best to use my day in Hilo, and the following day in Kona. I wake up at 8AM this morning, which is a bit late for me, so at least I’m starting to get into “holiday mode”. I go to the Rotterdam dining room for breakfast and have a cappuccino, and Eggs Royal (2 poached eggs on an English muffin with smoked salmon and some home fries), hold the Hollandaise sauce. I am starting to know the layout of the ship. The Statendam is the oldest ship in this series, and it is showing its age a bit, however as with other Holland America ships, it is kept up-to-date and spotlessly clean, and has a rich-looking décor without being “over the top”. My cabin is mid-ships on Main Deck. 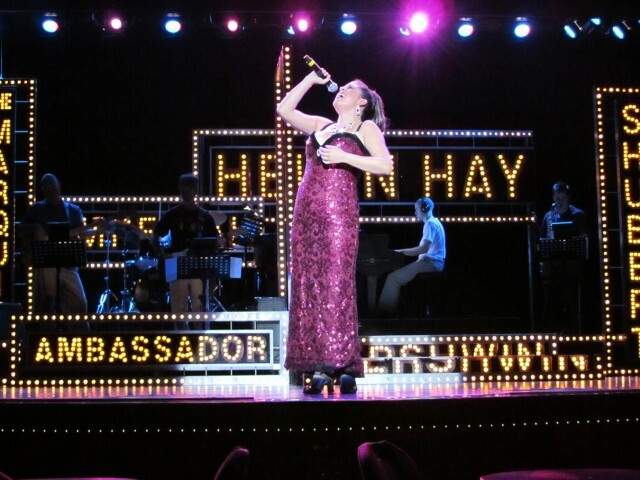 Since my cabins on my two previous Holland America cruises were near the bow, I have to learn the most efficient way to get to the places I most want to go to: the Showroom At Sea, the Explorers Lounge, the Rotterdam dining room, the Lido buffet, and the Sea View pool. It is formal wear tonight so I dress in my blue blazer jacket, dark grey dress pants and white shirt and tie. The Maître ‘d seats me at a large 8 seat oval table in the middle of the dining room. I order Rack of Lamb and have a glass of white wine…a very nice dinner indeed. I go to the Showroom tonight to see Bob Mackie’s Broadway, which is a song and dance show well performed by the ship’s resident troupe of entertainers. The Bob Mackie costumes look great, and I always enjoy the singing and dancing of the resident entertainment troupe. This is another day at sea, so I take in more enrichment speakers. Kainoa is a Hawaiian man aboard the ship as the Location Guide. Strictly speaking, he works for the Excursions Department, and his job is to sell passengers the ship’s excursions. Kainoa takes it up a notch, and gives very interesting talks on the ports, and is more like another enrichment speaker in my books. 9AM Showroom – Location Guide Kainoa Present: Honolulu & Oahu – Kainoa recommends going to the Ala Moana Beach & Magic Island, which are between the cruise ship dock and Waikiki, about 2 miles from the cruise dock. This sounds like a good plan for me, since I’m going on a North Shore tour one day, but I have the second day we’re in port to myself. He also mentions the Foster Botanical Gardens. Apparently they are both 2 miles from cruise dock. 2PM Showroom – Amazing Voyage of Charles Darwin – Clive Catchpole – Darwin’s work as a naturalist aboard the Beagle was nothing short of amazing. 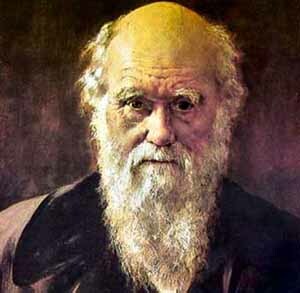 Keep in mind; Darwin was trained in both theology (which he hated) and botany (which he loved). The ship discovered Beagle Passage, an easier alternative to going ‘around the Horn’ of South America. Darwin noticed that mockingbirds and finches differed from island to island in the Galapagos Islands. Darwin predicted the decline of the Aboriginals in Australia, and waited 20 years to publish his famous work On the Origin of Species in 1859. Clive is an outstanding speaker, with a dry sense of British humour. 3PM Showroom – Location Guide Kainoa Present: Kingdom to State – Kainoa describes how the US annexed Hawaii, over the objections of the Hawaiian monarchy. Business interests drove this annexation. Now there is a “Nation within a nation” – Hawaiian sovereignty movement. I saw an old guy in the casino yesterday with a t-shirt slogan that simply said “I’ve been there…”. When Kainoa recently asked people in one of his talks who were first time cruisers, nobody raised their hands! That speaks volumes about the demographic on this cruise. Arman the Cruise Director mentioned in a previous session in the Showroom At Sea that one passenger has spent something like 10,000 days on board Holland America ships…more than 27 years, which exceeds Arman’s age! I go to the Rotterdam dining room for breakfast and have a Southwest Omelet and a cappuccino. One couple is from Connecticut and another couple is from Toronto, so they both have storm stories to tell – ice and hurricanes. The Toronto couple were aboard the Prinsindam when she sailed around South America and further south near Antarctica. Apparently the ship nearly capsized when it was hit with a double wave. According to them she was heeled over 60 degrees, they lost 80% of the crockery, and there were several injuries among crew and passengers. I may reconsider my plans to do that cruise! As in past cruises, the older folks are about evenly split between reading paperbacks and using various brands of electronic readers. I’m using my iPad for occasions when I feel like reading. I have a 650 page book I’m working on, and I also loaded a couple of year’s worth of magazines on it, so I have lots of reading material. My music is on my iPhone, and my documents are on my MacBook Air, so I’m well equipped to entertain myself with my high-tech gear. 10AM Showroom – The evolution of life on planet Earth – Clive Catchpole – Clive has turned out to be a real treasure on this cruise. He is witty, has a dry sense of English humour, and presents the most interesting lectures. I always take lots of notes at his presentations. There are no presentations this afternoon that appeal to me, and I have nothing planned. Several passengers and Clive have mentioned there is a Lysan Albatross flying with the ship, so I grab my camera and circle the outside decks looking for this bird to no avail. As usual, I skip lunch in favor of having a cappuccino and a couple of cookies in the early afternoon around 2PM. I take my iPad and read my book for an hour while I have my coffee. The ship has been lurching a bit in large 8’ swells, which are apparently coming from a couple of storms north of the Hawaiian Islands, where the captain tells us the swells are 20’. Weather reports are apparently good for when we arrive in Hawaii, but at the moment they have overcast skies and rain. We also have had overcast skies but no rain since we left sunny San Diego. The outside temperature is a mild 21°C during the day…not exactly time for swimming in the outside pool, but pleasant enough. I go to dinner this evening at 6PM, my usual time. I am seated with two couples that are both from Burnaby, so our table isn’t just Canadian…it’s British Columbian! One couple booked the cruise three weeks before departure date, and paid half fare. Obviously they didn’t get their choice of cabins, but they were upgraded from an inside cabin to an outside cabin, so they did pretty well. His luggage was lost by Air Canada/United in Denver, so he only has one pair of pants to wear, and had to rent a tuxedo for formal night, as well as buy spare socks and underwear in the shop. Apparently United will be paying them $300 for the inconvenience, and will ship his bag to Honolulu. I wake up at 6:30AM, which is too early, but setting the clocks back an hour last night has screwed me up. I head up to the Explorations Café for a cappuccino at 7AM. Yesterday the captain reported we were moving clear of the big swells and would experience confused seas, and that’s exactly what I see out the windows this morning. We still have overcast skies, and the sea is grey just like at home during the winter months. The ship is making 17.7 knots this morning, and we are within a day’s sail of Hawaii, so I’m sure the captain is pleased to be on schedule (as am I). I’m looking forward to the end of these days at sea. At day 5, I’m finding it a bit tedious, although I am certainly catching up on my rest! Breakfast in the Rotterdam dining room this morning was very pleasant. I was seated at a table for six: 2 Brits (SE England), 2 Americans (S central WA), and a Canadian woman (Calgary). We discuss the XL oil pipeline proposal. Of course the Americans are all in favour of the pipeline, and hate Obama. The English complain about the long tags on their clothing and other goods, which now have to accommodate all the languages in the EU. I decide it is time to do laundry this morning since I’m not interested in any of the morning presentations, and we are experiencing a tropical downpour outside. It costs $2 to wash (including detergent), and $1 for the dryer. I buy a roll of quarters from the front desk, so I’m set for the trip. While I wait for my laundry, there is a balloon toss game being played in the Atrium. It’s called “keep the guests busy” on their fifth day at sea! By Noon the Sun is out and the clouds are mostly cleared in favour of blue sky. 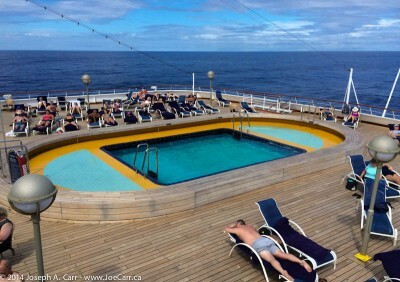 People are out on deck sunning themselves almost immediately! I decide to have some lunch in the Lido and eat out on the Lido pool deck where the HAL-cat band is playing. Now this is the typical cruise ship experience…all I need is a beer! It’s formal night tonight, so perhaps I’ll have a glass of wine with dinner. 1PM Showroom – The social life of animals – Clive Catchpole – Clive talks about Oxford biologist Richard Dawkins, who defends Darwin’s views about individual selection theories, but proposes that Evolution is all about genes being passed on, and believes that genes are immortal, unlike human bodies, Dawkins Book: The Selfish Gene 1978. This was another first-rate talk by Clive! He won’t be back until we leave Hawaii. I was going to listen to Kainoa’s talk on the History of the Hula after Clive’s presentation, but decide to skip it in favour of going for a swim in the Sea View Pool. 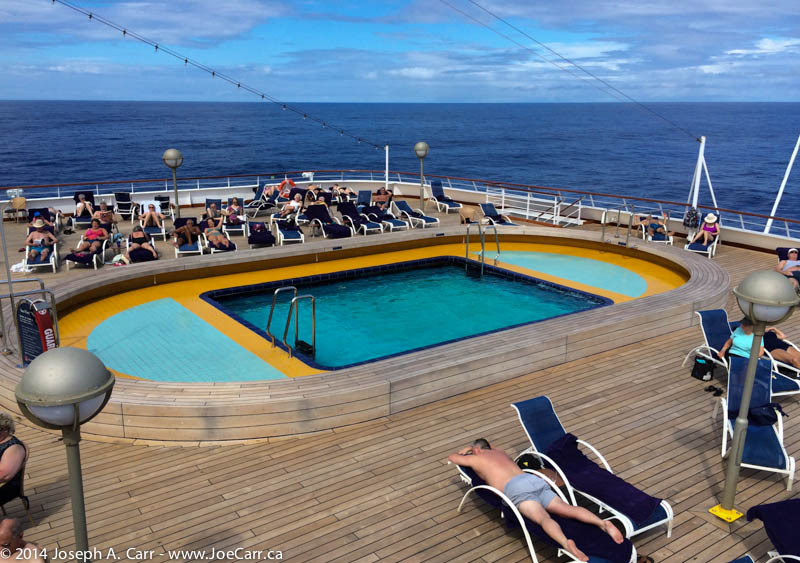 The water is cool, but it is great to swim a bit – a refreshing break from all my inactivity so far on the cruise. I dress for dinner and am seated with the couple from Atlanta, and the couple from Burnaby I previously met, and one other woman. After dinner, I go to the Showroom to see a magician and comedian act, but he is less than entertaining, so I leave mid-way through the performance. Since it is clear outside, I go up to Deck 14, the Sky Deck to measure the sky darkness with my Sky Quality Meter and to observe the stars. The lights are on up there, but I get an exceedingly dark reading. I also see the Orion (the Warrior) constellation on his side and Cygnus (the Swan) constellation, which is also flying on her side. Tomorrow morning we land in Honolulu, on the Hawaiian island of Oahu. I think it’s safe to say everyone aboard is looking forward to it. I know I am! This entry was posted in Pacific Ocean and tagged astronomy, cruise, Darwin, enrichment, entertainment, food, pool, restaurant, ship, speaker, swim. Bookmark the permalink.